After the press hype that Lancome Oscillation mascara has received, I normally would not have the slightest interest in the product. I mean, big deal, so the mascara wand vibrates? What rational person would fall for a gimmick like a vibrating mascara wand? You might as well put a battery in a pencil. But I had my reasons for wanting to check the product out. First, I come from a family with a history of essential tremor. If you're not familiar with the name of this motor disorder, you've probably seen or heard people with it, because it shows up as periodic tremors when a person uses his hands, particularly, for an activity that requires fine muscle coordination, like holding a spoon, or writing, or applying mascara. Both my parents have essential tremor, as did their parents. So, my first curiosity was about the possibility that Lancome Oscillation mascara might help women with essential tremors apply their mascara, thinking that it would be easier to hold the mascara steady and let the vibrations do the shaking. The second reason for wanting to try Lancome Oscillation is that I am an unabashed Lancome mascara user, and I was nurturing possibly the last vial of Lancome Amplicils that I will ever own, because Lancome discontinued the line. So, here I was, primed to be victim of media hype! The simple instructions were pretty intuitive: remove the wand from the mascara vial, hold the wand up to your lashes, and turn on the switch. The Oscillation worked right away, and I had fun experimenting with the mascara for the past three days. The Oscillation mascara formula is Lancome's best yet! You can see that at first glance, because there's no clumping on the wand when you remove it from the mascara cartridge. What happens though, if you apply many coats of the mascara, is that your eyelashes stick together. With a modicum of restraint, I found that you can achieve the same fullness with Oscillation as I could with Lancome Amplicils, without the clumps! I didn't count any oscillations per minute (opm); you hardly feel anything from the vibrations of the wand, certainly not enough to make you shake! As tremors occur when you move, by holding your hand still, bracing it with the other hand at the wrist, or leaning on the elbow to steady the hand, you allow the Oscillation wand's vibrations to do the shaking, achieving your mascara application. After two double espressos, which do cause tremors in my hands and legs, I applied the Oscillation by simply holding the wand under the roots of my top lashes and pressing the handy button on the Oscillation wand. To apply mascara to the upper portion of the top lashes, just hold the wand a little higher up on the lashes, upper-middle-like, and press. A few seconds is all it takes to cover the lashes with mascara. 3. Lower lash coverage is good, but a bit trickier! With long lower lashes, you'll want to emphasize them to their fullest, and the Oscillation does that. But it's difficult to apply Oscillation mascara without getting it on your lower eyelid. Maybe it's the short spokes of the wand's comb? The mascara comes off easily though with a damp swab. 4. The more the merrier or NOT? Up to a point, Oscillation mascara will thicken your lashes with each application. I would say three times is plenty. After that, it looks like you applied black rubber glue to your eyelashes. My recommendation is to obtain thick-looking eyelashes is to use a base coat like Lancome's Cils Booster XL prior to applying mascara. A base coat enhances your mascara by providing its own amplification and it protects your lashes from drying out from consistent mascara use. 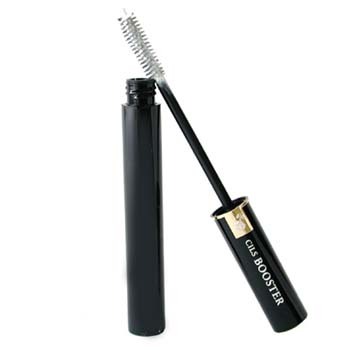 After applying Cils Booster, I only use one application of mascara, but at most, would use two for extra-thick! I applied Oscillation seven times and used different mascara and make-up removers to wipe it away. Of course, the more layers of mascara you apply, the more remover you use getting the mascara off. Mascara remover tends to be oily and you have to remove that before another application of mascara, so I prefer using pre-moistened make-up remover cloths and they work just fine to remove the Oscillation mascara. With the Lancome Oscillation mascara, the Lancome Cils Booster, and a lipstick, I'm ready to go. I just spent my entire make-up budget until Christmas! I'll update this column in six to eight weeks to let you know if Lancome Oscillation mascara keeps its initial attributes, but for now, I have to give it an excellent rating! It's the best mascara I've tried and I think the Oscillation technology works and will, in fact, be helpful for at least those women who experience essential tremors. Facelift in a Jar: Review of Athena 7 Minute Lift and Look 10 Years Younger By Christmas: Athena 7 Minute Lift Revisited Check out other product reviews on Boomer Babe's pages. Can A Robot Walk Like A Man? im sure some women would also find an "alternate" use for it. Ok, so I LOVE the mascara for all the reasons you outlined...but by August 31st...my battery is almost dead! How is yours? Any other complaints? I called lancome (1-800) but they are truly clueless about this new product. Sorry I got your message so late. And I'm sorry about your battery. Mine is still working and the mascara wand is clean... no sticky stuff or eyelashes on it. I haven't received other complaints, but I have contacted Lancome and received a clueless response as you did. If you have the receipt, perhaps you should return the mascara to where you purchased it. Most stores I have dealt with will take the product back if it's defective.